Back in May I did some overtime which gave me the ideal impetus to buy the sewing gadget I’d been lusting after trying to justify. Given that the price is the same regardless of where you buy it in Australia, I traipsed into my local sewing machine shop and bought it there. But I also bought some binders from the US on the same weekend – which managed to arrive before the machine did from the Janome warehouse in mainland Australia. Go figure. The machine went away to Orford with me for Creative Camp and that was my first real experimenting. I had four garments waiting to be finished that I’d packed, some hemming and some topstitching on knit garments. I’d previously used Mum’s overlocker which converts to coverstitch and that was what really sold me on the idea. Use reasonable quality thread. Regular overlocker thread is OK, the large Birch rolls are just fine, as are Gutermann making for very predictable in results. The three reels of cheap crappy unnamed thread you’ve been using in the overlocker without trouble for the last 19 years (but are the only ones in the right colour) make a mess, and leads to frustration. Play with the direction you cut the strips for binding. Some works better on grain and others cross grain. It’s surprisingly easy to use, if you pay attention to points 1 and 2. Read the Patternreview threads, and Melissa of Fehrtrade’s binding tips. Some hemming with the matching colour up top and white underneath. Doesn’t show through. Winding off some of the gutermann thread onto a bobbin saves buying two reels. Topstitching this top was so easy. I’d previously tried on my sewing machine and got horrid results with stretching and sliding all over the place on this cotton viscose knit. The trio of machines at Creative Camp – the coverstitch is on the left. Since then I have made a wee baby wrap top for NNTB and last night used the binder to edge a vest my son and I have been working on. I suspect binding the edge of slippery nylon, sleeping bag innards and merino knit lining is pushing it. 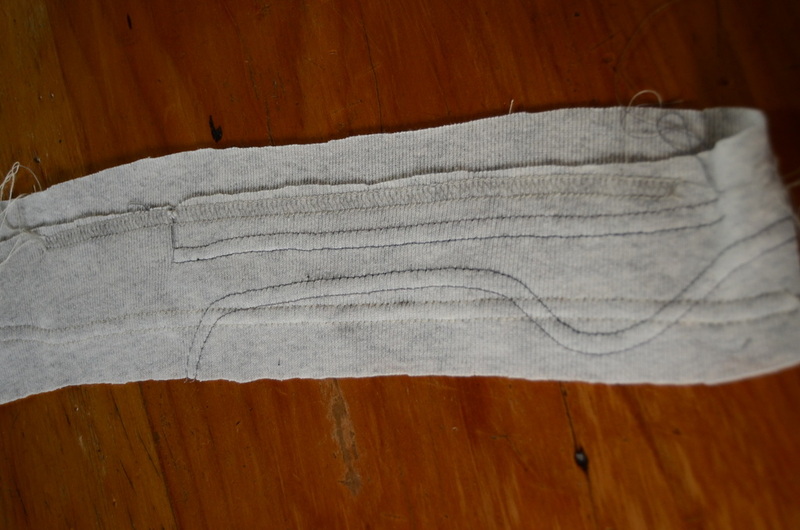 The stitch length shortened as the machine didn’t feed the layered fabric through quickly enough but I was leery of changing the stitch length too much as it was working.I just concentrated on lining everything up straight and keeping an even speed. Ruby cat loves this vest. What cat wouldn’t? A garment made out of a sleeping bag? I’d put the vest on the table, turned my back and she’d claimed it. As I write now she is sitting on it over on the couch. Maybe I should make a cat blanket next? After waking up early on Sunday morning, Day 5 of Creative Camp (May 27) saw the creation of a VERY loud orange pleated skirt. Which made me happy. I used Burda 7529, a pleated skirt pattern. Initially I thought I wouldn’t have enough fabric as the corduroy was only 108cm wide. Then I realised there was a box pleat on each side seam, and I didn’t think I needed that adding to my silhouette! Deciding to remove that pleat was a good move as the cord has a reasonable amount of body. 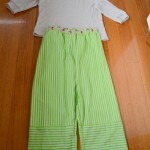 I also sewed the bright blue lining into the ruffle skirt (yet to be photographed) and took it home to handsew the hems. All in all, a fabulous five days of decompression prior to starting a new job. Our next one is planned for October and it’s prompted some thoughts about other, more communal sewing events too. umm, how did we get to June 11th? So much has been happening, that I’m going to try and catch up on some of it today here and spread the rest of the posts through the week. Thank goodness for an extra weekend day. We will be celebrating the official birthday later today. With cake. And cups of tea. And all the grandparents, one of whom emigrated from the UK. Reason enough for cake I think! So, this weekend has had three sewing related projects so far. None of which were on my list on Friday night. Niece/Nephew-to-be (hereafter to be known as NNTB until the little thing gets a name) now has a tiny onesie in it’s box in the hallway. It joins the last couple of rugs from CreativeCamp which now have their quilting stitiching. Thanks to Jenny for deciding on what sort of designs to do. And who took the remnants of B&W dalmatian spots off to make a bag. I used a free tutorial and pattern from Nefertari for a wrap around style onesie. To be honest, it was the opportunity to get more confident with my coverstitch machine that really attracted me. The practicality of a wrap around rather than pullover for a small baby seemed nice too.The instructions are clear and well thought out. I learnt that you need to be aware of your thread quality with the coverstitch. On Saturday night I was having all sorts of trouble with thread breaking and looking generally horrid. I had planned to test out my bindings and fabric layers so was prepared to do some samples, but not so much for this. I switched back out to better thread and changed the colour of the binding I would use to match the thread I had and all was well. After Melissa of Fehrtrade’s summary of what she learnt I’d mistakenly pysched myself up for having to change the fabric I was using! I am sure when I sew something more complicated than cotton jersey I will need to keep her post in mind. An emergency make yesterday afternoon was a single slipper for the stressed (exams) and tired university student. My son could find one slipper but not another. So, from the remains of a conference bag for the sole, and an old polar fleece jacket for the inner sole and upper, Zac now has two warm feet. Still on the dining table is a vest for Zac too. Made out of a too-light-for-Tasmania-really sleeping bag and some merino knit. We harvested the zip off the polar fleece jacket which gave us the slipper so that can move forward without going shopping. I am going to try binding the edges to sandwich the layers together. After the stormy weather on Friday, daylight on Saturday revealed the beach had been cut in half by the stream. See the missing sand? And also we saw the full view across to Maria Island for the first time not obscured by rain or clouds. Two of four of the baby rugs are finished for the niece/nephew-to-be. Rather than a formal quilting approach, I fairly randomly stitched over one stripey rug. The red dotty rug used a couple of arbitrary rules – only changing direction on a dot, and only crossing an existing stitching line where a dot also lay. The other two are now awaiting attention at home. … and the twirly green Vogue 8663 dress was the fourth. This project one didn’t get finished either. Here I am trying out the ruffle for a grey work skirt by pinning it to my Lola dress which has a handy princess seam line to follow. It only needs the hem to be handstitched. Me-Made-May Day 26 Report – all of the above clothes for photos, with the blue/cream stripey Lola dress for most of the day. We set the alarms for early Sunday morning to get some more done before we had to pack up and head home. Today was the day for finishing the grey Cambie dress with modified neckline. Late yesterday I’d taken a little nick out of the fabric when repositioning the invisible zipper. Last night I thought I could rescue it, but this morning I looked at it in the daylight and decided to replace one side of the back skirt – I had plenty of fabric so it was a sensible decision. As the fabric has some horizontal stretch the front neckline stretched out woefully so I hand gathered the seam allowance and then stitched on some ribbon as stay-tape. I had to bring it in about 1 1/2 inches in total! With a bit of steam the main fabric eased in nicely and stopped the impressive gaping. In a brief break in the rain we had a photoshoot on the deck. Despite the sleek A-line, there is still enough room in the skirt for a bit of silliness. Some magpies joined us for lunch. They came yesterday too, so I’d saved some steak trimmings for them after watching them wolf down the moths that had battered themselves to an untimely death against the uncurtained windows. I’ve also been sewing some underwear, but I am sure the internet can cope just fine without seeing that! I’ll wear it tomorrow and see if it’s comfortable. Me-Made-May report: Worn this morning – newly minted grey trousers, purchased top. 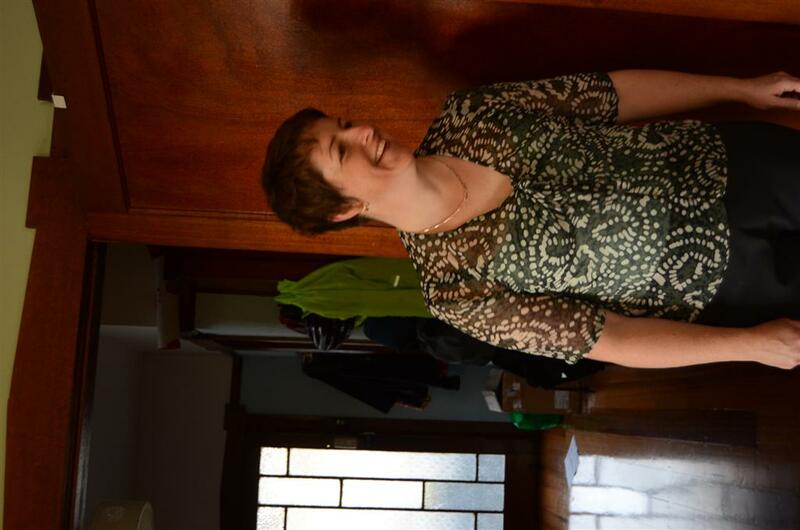 Then the even newer Cambie dress to a retirement party back in town, covered with a Renfrew top because it was so freaking stormy and horrid. And a polar fleece jacket whenever outside too. Yesterday marked the start of CreativeCamp2012, an event we have decided needs to be annual! We probably need a logo too. A few weeks? months? ago, we were driving somewhere and I mentioned to my husband about the idea of the Pattern Magic courses held in the UK at Morley College which I’d heard about through Melissa at Fehrtrade‘s write up. Which morphed into discussion about who I could rope in from the local technical college’s fashion department to lead a similar workshop locally (Liz, I’m thinking of you and your custom garment making students), taking over my husband’s office for a day – he’s got large tables and a coffee machine. Or harassing the local adult education mob into running a workshop. Or just getting off my rearend and setting aside a day to play pattern magic at home. 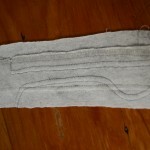 Which I did – drafting and testing an asymmetrical cowl neck top which I hope to sew up soon. Rocket the dress form has been wearing the muslin since then. A short gap between jobs for me made a perfect window for “CreativeCamp2012″, so yesterday we packed up sewing machines, fabric, video cameras, the office coffee machine, sound recorders, wetsuit gear, cameras, red wine, books, and some knitting for good measure and set off for Orford, an hour’s drive from home. Oh, and we decided tender writing also fitted in as creative writing activity – a couple of opportunities to good to ignore. You can’t tell in the silhouette but [for Me Made May reporting purposes] I’m wearing a dark grey cowl neck Renfrew with a green cord Crescent skirt. Day one started after lunch with sewing together a pair of Jalie 2908 jeans made into comfy casual trousers by widening and straightening the legs. Soft grey cotton sateen which is so soft to wear. And filling a wardrobe gap for me-made-may. When I went upstairs that afternoon to get my jeans to cross reference the fly front construction I discovered I was pyjama-less. And it’s chilly here. So I made a pair of pj bottoms out of some flannelette I’d brought along (originally to make a baby rug for niece/nephew-to-be). They are just below the knee to cater to the fabric I had. I used some stretchy tshirt fabric as waistband and cuffs. A quick make. 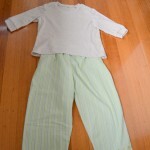 I used the Jalie 2908 pattern for the crotch curves, and ballparked the ease needed for pjs. Robin went down to the beach for some video and audio recording. His planned shoot went out the window; the oystercatchers’ behaviour triggering some new ideas for a possible art piece. He came back after dark, wet to the knees and happy Another use for video camera lights – torch in the dark. My final job for Day1 was starting on four baby rugs for niece/nephew-to-be. My sister in law has a very defined colour scheme in which Spotlight’s range of printed flannelettes for babies just wouldn’t fit. Can you tell her chosen colours? I used the Colette Sewing Handbook continuous bias binding instructions to make 20 metres of red 25mm bias binding for the edges. See, I needed to pack my library and gadgets! Day 2 started with a sleep in. Bliss. I think I might have been tired. Me-Made-May report – slept in new PJs and an unblogged red LS tshirt, Daytime: stripy Vneck renfrew and shiny new grey trousers – literally. It’s sateen. Baby rugs took longer than I wanted and I was getting pretty cranky by the time I had all the binding on to ‘Aunty Kirsty’ standards. Next time I expect to do that I will buy an adjustable bias binding foot thingy for my Elna. The main fabric is sewn up, I needed to have taken out some height in the bodice, so I have raised it at the shoulders and will adjust the pattern for next time. Lining is cut in beautiful blue colour as the grey wasn’t right. Now it’s time for dinner! CONFESSION: In the whirlwind of job hunting, interviews, resigning and last days (today! ), a box of cool and strange wonders from Anne of Pretty Grievances arrived. And I wrote a post and promptly left it in ‘draft’ status. Oh crap, too embarassing for words.Let’s just keep that a secret between us and the interwebs shall we? Anne was my swap partner from One Cool Thing, One Strange Thing Swap organised by the Perfect Nose. When the box arrived I opened it to discover some luscious embroidered red drapey fabric, some blue speckedly knit which Participation Cat promptly decided was hers, McCalls 3091 – a pattern for a dress and jacket, and some odd notions. Not really odd at all ! I can see me making the dress in a linen for summer, shortening the length a bit. The red fabric I am thinking about rolled hem edges on a garment of some kind. A little strange to figure out the hem finishes first, I’m currently intrigued by pushing my overlocker a bit further and think this would an ideal candidate. A dress or a top, I am yet to decide. The blue knit, once I wrestled it back off the cat, demanded to be made into a big snuggly jumper decorated on the shoulders with the buttons. Thank you so much for these treats, I’m tickled pink with the excitement of parcels in the mail. 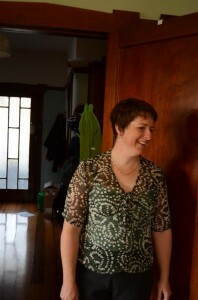 Top Half: Knot top made for OWOP, purchased green camisole to keep it decent. The day didn’t get to the promised 23 degrees so the yet-to-be-blogged red cardigan got called into service. Tomorrow I will use my “keep an exception open to wear my RTW suit for job interviews” clause. But there’ll definitely be a me-made top as part of the mix. Fingers crossed! Look what the postman brought me! TJ, the instigator and co-ordinator of the One Cool Thing/ One Strange Thing swap sent bonus packets out to each participant which is a truly generous idea. I’d let on that I’m trying to inject some more colour into my wardrobe and this luscious blue green DKNY knit hits the spot beautifully. 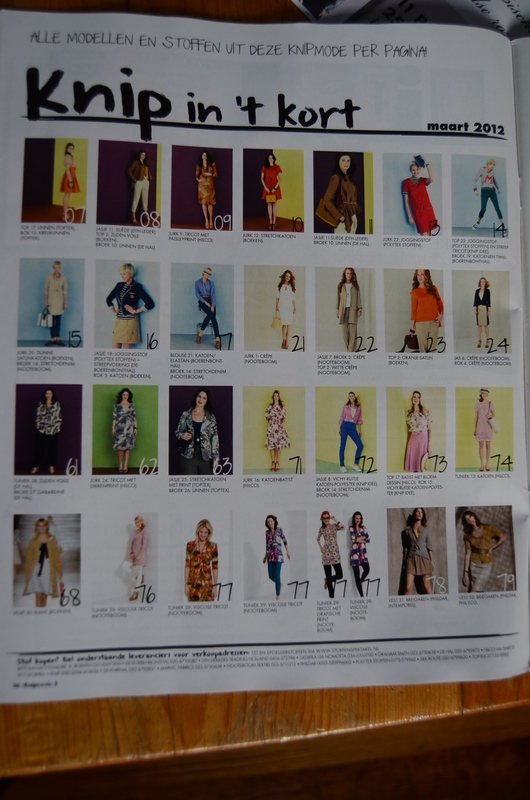 I’m spoilt for choice of patterns with the Knipmode March 2012 and the special extra included. And it needs to be a pattern that will make the most of the gorgeous button TJ included. A dodgy photo of the overview page from this Knipmode. Thank you!! I’m looking forward to finalising my plans for this fabric and revealing the make here on my blog. The big reveal for Karen’s Pyjama Party! 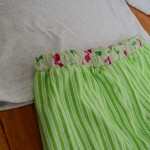 I made two pairs of PJ bottoms and 2 tops in preparation for Me-Made-May and also so I could discard the PJ tops that now seem to be wider than they are long as they have shrunk and stretched in the wash. The paler green stripe is a brushed cotton, the brighter green are snuggly flannellette. I had some green and pink rabbit fabric to use as highlights. 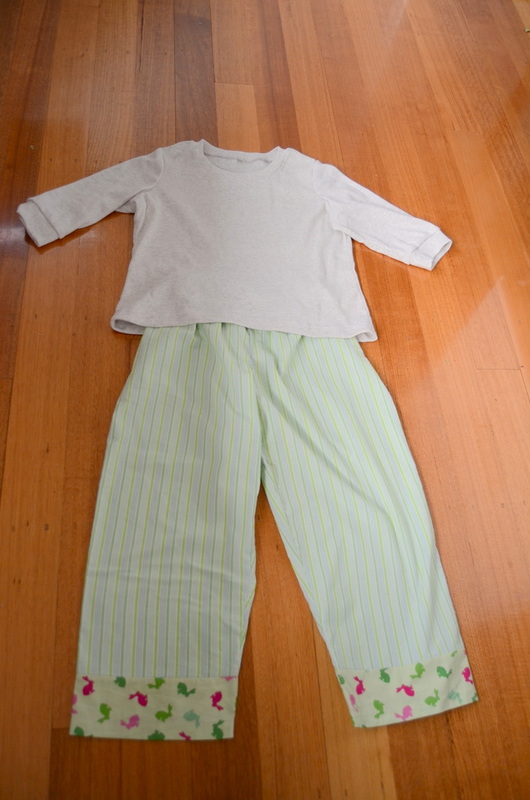 The tops I made out of left over cream marle cotton ribbing from when I used to make baby and toddler clothes and sell them at a local market. So that is about 19 years old – and I still have another metre or so left. I know from past experience it will relax widthways so I made sure I put stay tape in the shoulders, and might need to add some to the back neckline. And be prepared to take in the side seams in a couple of months. 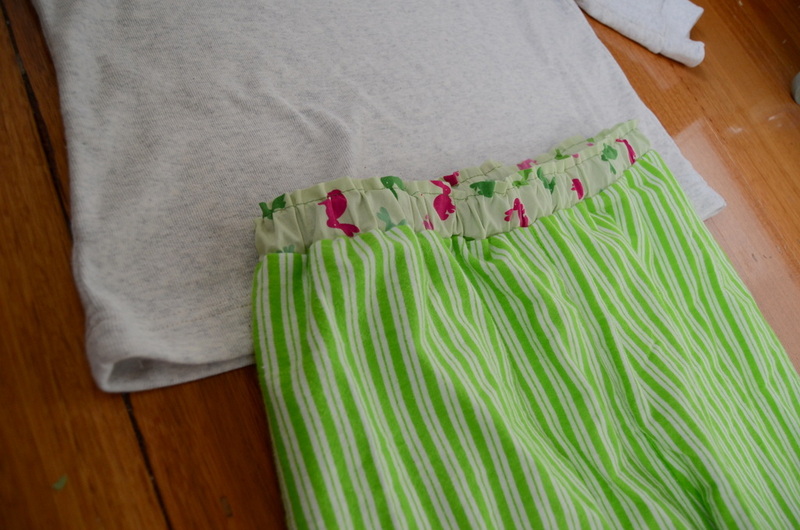 Update: I forgot to add that the pattern for the PJ bottoms was traced off a pair of shortie pjs, and the top is a Renfrew cut with extra 1 inch added at each side seam and down the arms. Is there nothing the Renfrew is not useful for??? The odd looking sample photo is included as this was also my first play with Mum’s coverstitch feature on her overlocker. The cream rib needed a little bit of adjustment on the differential feed but otherwise using the coverstitch to do the hems was easy as pie. I’m looking forward to a loan of her machine shortly. I didn’t have quite enough of the bright green flannellette to cut the legs in one piece. So I created a ‘design feature’ of huge cuffs going the other way. I rather like it! Karen, you wanted to know what was on my bedside reading pile? 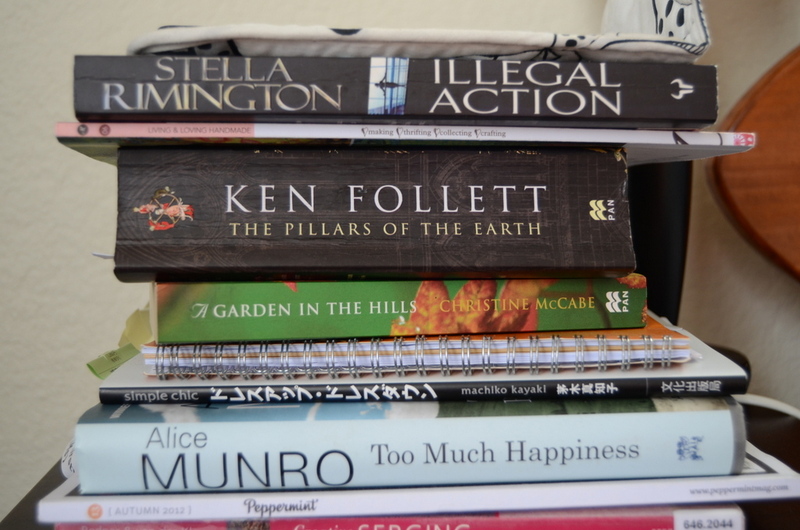 This is the pile next to the bed, nearly all of which should be put away as I’ve finished them. The Stella Rimington was a re-read when I needed something with a good plot which I couldn’t quite remember. Escapism when sick. Mollie Makes for eye candy. And sussing out cool crafty stuff in case we *do* get to London later this year. 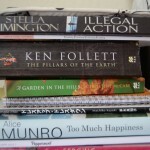 Ken Follett – another re-read to help me sleep. Christine McCabe – When it’s horrid out – to reconnect with the joy of gardening. Another re-read. Still part way through this. A notebook for ideas. I prefer graph paper in my notebooks, it makes me think differently to standard lines. 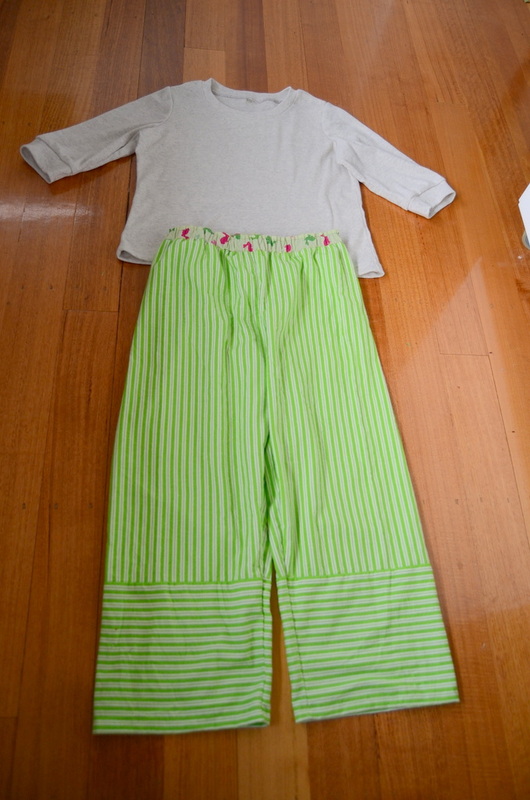 Simple Chic – Japanese dresses by the bed to choose which ones to make. See sticky notes protruding from the top. I want one of each. Alice Munro – A book of short stories. Recommended. Soft, gentle but heartwrenching. Peppermint magazine – eco-cool/fashiony/homey. I bought a subscription for a year. Normally when I buy a subscription to a magazine they go out of business withing two years. Sorry Peppermint, I do like you really. Squished at the bottom – Creative Serging from the local library. Gee, what some people do with overlockers is scary. But the tips for adjusting tension and turning corners are handy. Now I’m off to put away most of those in their rightful homes.